This shot is from summer 1997. 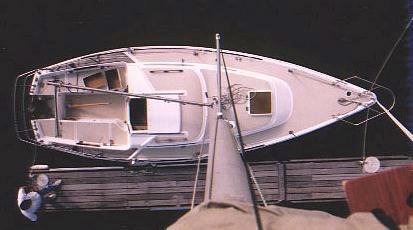 You can see the changes we have made to deck hardware since the first masthead photo from summer 1995. You can see the 14 foot T-track sections on the rail, the deck plate on the bow, rub strips near the bow for the spinnaker pole and padeyes near the bow to lead the life-lines down to the deck. You can also see the Tuff-Luff head foil we added for the 97 season. We had hanks before. The headfoil has 2 grooves and sail changes can now be made without going headsail-less which was always unpleasant. The main is pretty small and doesn't have a lot of drive by itself. We are usually changing to a larger headsail as the wind is backing down. Trouble is the waves lag behind and the last thing I want is to be underpowered in chop with light wind. We considered a roller furling but that would have cost a lot more and the sail shape is no good when partially rolled up. The draft is too deep and the center of effort is too high. If we do go to a roller in the future our sails are ready with the luff tape.